'Bhasha MoviEcard 199' entitles the user for 3 New Movies from Monday to Thursday valid for 30 days. MoviEcard holder is entitled to watch one 'movie title' twice and a maximum of one movie a day.The MoviEcard is Non-transferable and is to be used by the registered card holder only. Not valid for recliners & sofa seats. Additional charges will be applicable for glasses for 3D movies. Buy now. MoviEcard Unlimited - What Is Bhasha MoviEcard Offer? What is Carnival MoviEcard 199 Offer? What is Carnival MoviEcard 399 Offer? Buy #MoviEcard and catch all the latest movies without the hassle of being caught. If you are a fan of watching movies in theatres, MovieCard is a blessing for you. It is service launched by Carnival Cinemas to get you the best movie viewing experience. To keep you entertained at the low budget, Carnival Cinema’s MoviEcard brings out multiple cards offers like Carnival Cinema MoviEcard at Rs. 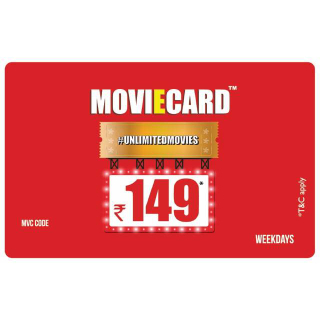 149 and Bhasha MoviEcard through which you can watch 3 movies in your language at affordable prices. Additionally, you can purchase Carnival MoviEcard at Nearbuy without any hassle. With the Bhasha MoviEcard 199, users will get to watch 3 new movies between Monday and Thursday. The offer is valid for 30 days from the date of issue. In addition, a MoviEcard holder can watch one movie title twice during the offer period. However, the maximum number of movies that one can watch is limited to one per day. Carnival MoviWcard 199 is not applicable to movies dubbed in other languages. For instance, if a customer selects Hindi language, movies like Robot, Bahubali, and Avengers are not eligible for the offer as the original language of the movies is different. In case, a user wants to watch the dubbed movies, he requires upgrading the MoviEcard card to Carnival MoviEcard 399. At a given time, users can buy only a single Bhadha MoviEcard. The MoviEcard is non-transferable and only registered cardholder can take advantage of the offer. Ticket booking via MoviEcard is subject to availability. Only limited seats are available via MoviEcard. A nominal redemption fee is applicable on every transaction on the Box office or website. Bhasha MoviEcard Offer stands void on recliners and sofa seats. Additional charges are applicable for 3D movies. MoviEcard cardholder can use only one phone number per card. Only selected cinemas are eligible under Bhasha Moviecard 199 offer. Do you want unlimited access to the latest movies? If so, MoviEcard unlimited is what you need. On availing the Carnival MoviEcard 399 offer, users can watch a new movie every day from Monday to Thursday. The validity of the MoviEcard 399 is limited to 30 days from the date of issue. Under the offer, one can watch one “movie title” only once and a maximum of one movie in a single day. MoviEcard unlimited 399 Offer stands void on recliners and sofa seats. Prices of movie tickets are subject to change without any prior notice.